The U.S. Treasury Department describes al-Nuaymi as “a Qatar-based terrorist financier and facilitator who has provided money and material support and conveyed communications to al-Qa’ida and its affiliates in Syria, Iraq, Somalia and Yemen for more than a decade. He was considered among the most prominent Qatar-based supporters of Iraqi Sunni extremists.” Al-Nuaymi transferred $600K to Al Qaeda in Syria in 2013, and sent $2 million monthly to Al Qaeda in Iraq for an undisclosed period of time. 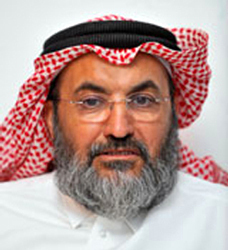 He is also described as an interlocutor between Qatari nationals and Al Qaeda in Iraq leaders. According to U.S. officials, “Al-Khawar has worked with Kuwari to deliver money, messages and other material support to al-Qa’ida elements in Iran. Like Kuwari, Khawar is based in Qatar and has helped to facilitate travel for extremists interested in traveling to Afghanistan for jihad. The UN describes al-Subaiy as “a Qatar-based terrorist financier and facilitator who has provided financial support to, and acted on behalf of, the senior leadership of Al-Qaida (QE.A.4.01). He provided assistance to senior Al-Qaida leader Khalid Sheikh Mohammed prior to Sheikh Mohammed’s capture in March 2003. Since that time, he has provided financial support to Al-Qaida senior leadership in South Asia.” Al-Subaiy served a brief prison sentence in 2008 before being released by Qatar. The Egyptian-born, Qatar-based spiritual father of the international Muslim Brotherhood sits atop a massive terrorist funding network including the “Union of Good” umbrella network of charities that funds Hamas. Qaradawi was also a sharia adviser for Al Taqwa which provided banking services to Al Qaeda.